There is just one change on the Kilkenny team to play Dublin in the final round of the Allianz League on Sunday in Parnell Park. Conor Martin comes in at corner forward with Alan Murphy resuming his sub goalie role. Lester Ryan, Pat Lyng, Jonjo Farrell and Mark Bergin all take their place on the match day squad following injury. Click on Read More for full team and subs. Supporters are again urged to purchase tickets before travelling from the usual supermarket outlets. The game is not being covered live or deferred on TV. There will be live radio commentary from KCLR 96FM and we will have score ipdates on our twitter feed @KilkennyCLG. 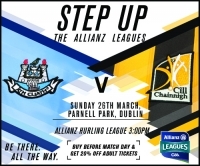 This Sunday Kilkenny travel to Parnell Park to take on Dublin in the final round of the Allianz League. With only 2 points separating 5 teams in Division 1A all teams are still in a position to qualify for the quarter-finals. For Kilkenny, who are are on 3 points and lying in 5th position, the objective is simple - a win over Dublin will secure a quarter-final place. Please note all games in the final round throw in at 3pm. Tickets for the game are now on sale at the usual Supermarket outlets and on-line at gaa.ie. Supporters are again advised to purchase tickets in advance to avail of discount and to avoid queues on Sunday. Hurling was the winner in Thurles on Saturday night when Kilkenny and Tipperary played out a pulsating draw in Round 4 of the Allianz League. The draw puts Tipperary safely through to the quarter-finals while Kilkenny will need to defeat Dublin in their final game in Parnell Park in two weeks time to possibly qualify for the quarter-final. Clare, Waterford and Cork are all on four points so the winner of the Clare v Waterford game in Ennis will qualify. Cork entertain Tipperary in Pairc Ui Rinn and they too will be looking for a win to move on to 6 points and a quarter-final berth. Nothing is certain and it will all be decided on Sunday 26th with all games having a 3pm throw in. What is certain is that Kilkenny's point earned in Thurles on Saturday night could yet prove crucial. Click HERE for images of the game from Willie Dempsey. Click HERE for images of the game from Martin Rowe. Click on Read More below for League Table. There are three changes on the Kilkenny team to play Tipperary in Round 4 of the Allianz League in Semple Stadium on Saturday night. Shane Prendergast comes into the defence replacing Kieran Joyce. In attack Liam Blanchfield and Alan Murphy come in to the full forward line replacing Richie Leahy(Injured) and Conor Martin. Darren Brennan of St Lachtains takes his place on the bench as sub goalie. Tickets for Saturday evening's game are now on sale at the usual Supermarket outlets. We again appeal to supporters to purchase tickets before Friday night to avail of discount and to avoid queues on Saturday in Thurles.